Native Americans used fire to manage rangeland for thousands of years, but a hundred-year burning hiatus followed European settlement of the North American heartland. Those decades of fire suppression allowed invasive plants to negatively alter the landscape. 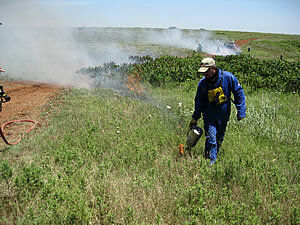 Now, rangeland researchers and managers are proponents of burning, when done safely and in a controlled setting. In the past few years, ConocoPhillips grants have been awarded to support the development of Prescribed Fire Councils in Oklahoma and Kansas, which are helping landowners put fire back into the natural cycle of the plains. The Kansas Prescribed Fire Council, which is being partly supported through a 2012 ConocoPhillips grant, is now incorporated as a non-profit organization and recently finalized an agreement with the Natural Resources Conservation Service and Kansas Forest Service to house and supply their full-time coordinator who will work toward expanding membership in local prescribed burn associations and increasing the number of acres burned within the state. The organization is also planning to offer affordable liability insurance as well as training and equipment to help landowners conduct prescribed burns.